A Backup Set backup set could have more than one client from which data is to be backed up. 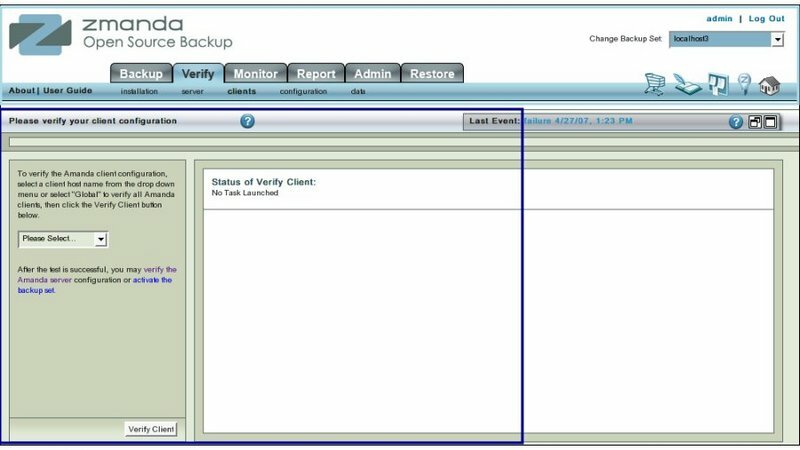 The Verify Client page allows users to check the Backup set configuration as it relates to the Clients. 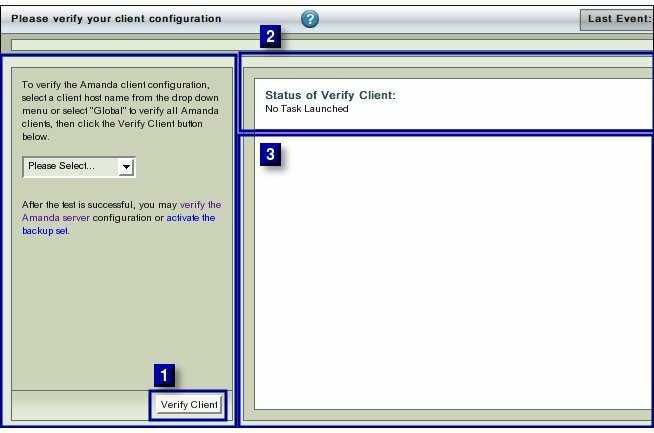 The main functionality of the Verify Client page is to allow users to check out that the Client configuration in a Backup Set. Run Verify Client whenever you configure or change a Backup Set. configuration. It is recommended to run the Client Verification after any change to the Backup What list. The Verify Client page has one additional feature compared to other Verify pages. All the Client Hosts that has been specified on the Backup What page. This is option is at the bottom of the drop down list. Or select a single Client Host from the drop down list. To verify two or more Client Hosts, users will have to chose them one after the other and conduct separate tests for each of them. Select either 'All' clients or any one of them to Verify from drop down box No 1. Click the Verify Client Button (No 2 above). The text in upper right hand rectangle (No 3 above) will change to indicate that the Client Verification process has started. Further Progress messages/ error messages will appear in area No 4 . ZMC's checks on a Client Host can give rise to a wide variety of error messages! The error messages are verbose to help users to determine what caused the error. Here the Host name specified in the Backup What page (though valid in terms of formatting rules) does not correspond to any entry in the Domain Name Server. Hence DNS cannot provide any IP address for the next step of checking to begin. Go back to the Backup What page and correct the entry so that it corresponds to a DNS name. Come back to this page and verify the Amanda client without having to go through the previous successful checks. Verification messages may have hyper links (selfcheck request failed in this example). Clicking on the hyper link will provide additional information about the message from Zmanda Network Knowledgebase or the Amanda wiki. The Amanda user must have root access on the Amanda server and all the client hosts that it is expected to backup. The Amanda client software must be installed on each client separately. If these tasks have not been carried out, Verify client will give users verbose error messages when verifying the client. Please successfully verify all the clients before activating the Backup Set. On success, users should go to Backup Activate page.